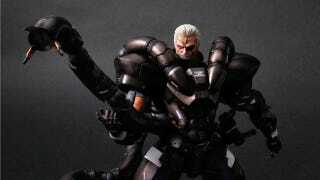 I liked the last Metal Gear figures Play Arts released, but I like the looks of this one a lot more. Metal Gear Solid 2's Solidus Snake is the next character from the series to get the action figure treatment from Square Enix's toy division, and he's a beauty. You'd think those arms would be a nightmare, but no, they're done perfectly. He's also packing two rifles and two swords, and will be out in November.